This brush is the preferred brush of squirrels worldwide...looks and feels like squirrel hair, but it is synthetic. Perfect for blending, glazing, fine detail, and washes. Less expensive and more durable than genuine squirrel hair. These brushes are made from a blend of synthetic hairs. 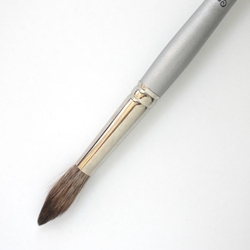 The result is a brush that has a bit more spring and snap than white nylon watercolor brushes. They are still very soft and will hold a lot of watercolor! They will also work well with acrylic, oil, gouache- just about any kind of paint!